So glad you stopped by today – I have a very special card to show you. 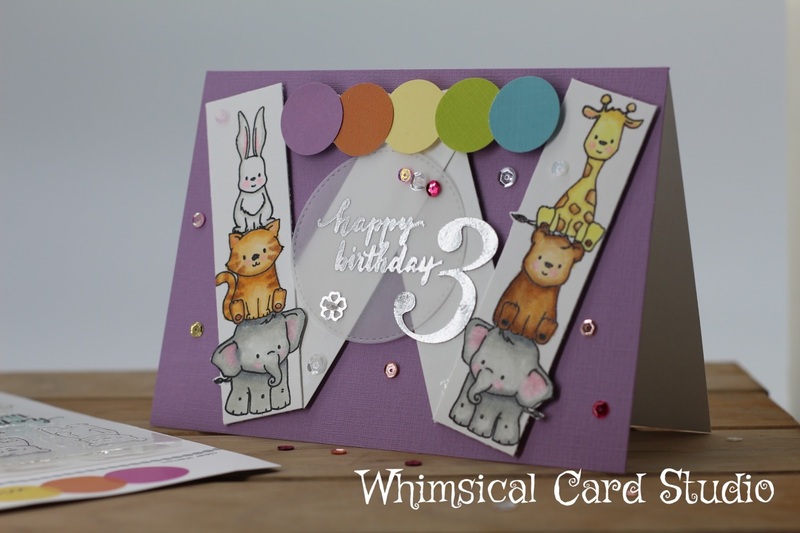 As you may know from several recent previous posts, I have been creating for the 10 open challenges for Winnie & Walter’s 3rd birthday bash. This is my last project being entered into the Critter challenge with design team member, Gayatri. This challenge is closing Monday, March 6, 2017. If you arrived here randomly and want to see what inspired this post, click here for Gayatri’s challenge. This challenge involves using critters on your design and I thought how fun it would be to create a birthday card for this one to W&W. The “W” was made out of 4 strips of paper, each 1” wide. I stamped the critters directly onto the strips and colored them before trimming them down to their final size. 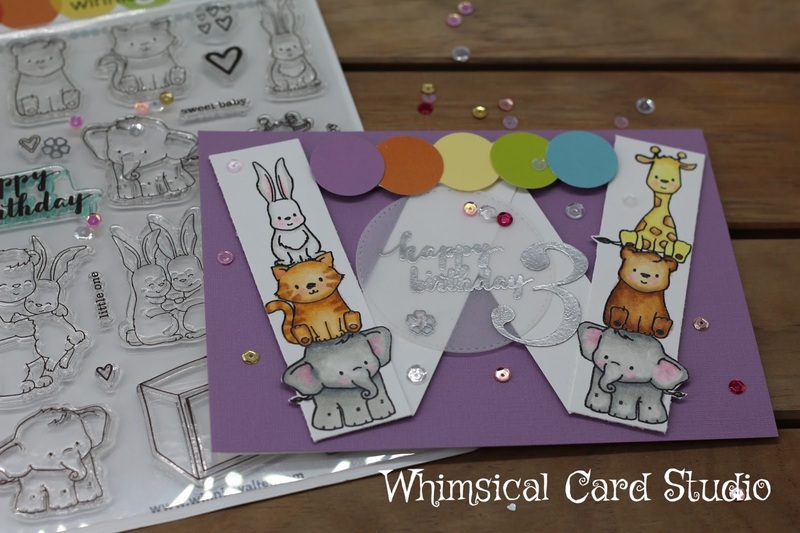 Using a 1” circle punch I cut 5 circles from cardstock to match the W&W logo and glued them to a strip of paper to add later. The critters were stamped in black versafine ink, heat embossed with clear embossing powder then colored with Spectrum Noir markers. 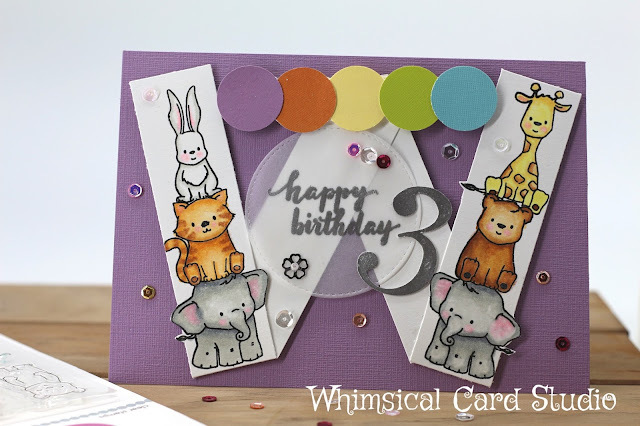 The sentiment was embossed in silver on top of a circle of vellum and I die cut a “3” to glue onto the edge of the circle. I used foam tape to pop up the logo piece (5 circles) at the top and embellished with some of the sequins I received free with my stamp order. Thanks again for stopping by – I’d like to invite you back to see my next card magazine inspired project which I am doing once a month. Be sure to subscribe if you want to keep up with the crafty happenings! Really cute and different! Love it! Thanks for sharing!!! Hi Brenda - thank you for your kind comment! This is so cute!!! Love the W with the critters making up the alphabet!